If you're a long time Ravalation reader, you know I love snail mail. In fact, I had such a great time getting mail from readers and other bloggers and making my own new year's card last year, that I'm doing it again! As always, I'll be drawing the card myself. I haven't settled on the theme yet: might be Rogue One, might be Fantastic Beasts, might be Knights of the Eternal Throne... anything geeky. If you want to mentally prepare for what type of abomination you might be faced with, check out my Drawing diary entries. So how does it work? Simply fill your e-mail and post address in the form below (not in the comments!) and submit. I will then e-mail you my info so we can exchange cards! The card swap is open internationally. I live in the Netherlands, but will send cards to everywhere. Note that it may take a while to arrive depending on your location. Entries will be closed around Christmas, so I'll be sending New Year's cards (no way they'll arrive in time internationally otherwise). That said, you can send me a Christmas card, or a New Year's card or a teabag with your favourite flavour... whatever you prefer; it's all for fun. Also, it doesn't matter if you use your real name or pseudonym; the postman will deliver either way - just go with what you feel comfortable with. Finally, if you participated last year and want to again (yay), please fill in your address in the form anyway. It's nice to have everyone's info in one place; I'd hate to forget someone! P.S. 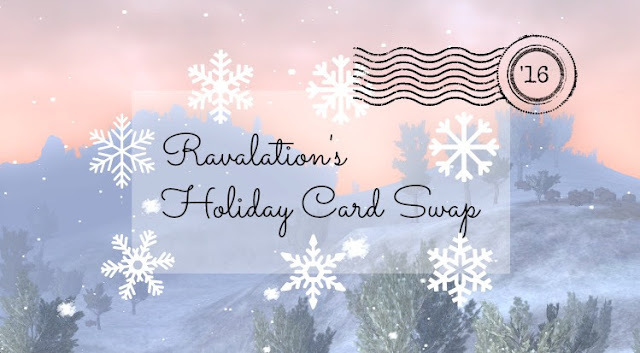 If you're addicted now and want more geeky snail mail, check out Kay's 3rd Annual Holiday Card Swap. Haha. See, that's the difference. You *learn* from things!